Clarity Finances specializes in managing and maintaining QuickBooks for small to medium sized companies. QuickBooks does a great job at keeping track of money going in and out of a business and can provide a business owner detailed and customized reports. Clarity Finances works with companies who want to ensure that their books are set up correctly for the most accurate data and the most painless end of the year taxes. QuickBooks is fairly easy software to use, but it is also very easy to enter the data incorrectly without the proper training and guidance. Clarity Finances can visit your office periodically and if needed, input your transactions for you ensure that the data in the database looks correct and that it reconciles with corresponding statements and print requested reports from the QuickBooks file. We also address any questions and concerns. Julie Shopa of Clarity Finances has been a Certified ProAdvisor with QuickBooks since 2000 and Advanced Certified since 2007. She graduated from Penn State University with a degree in finance. Julie Shopa has been in the bookkeeping and accounting industry for over 25 years. Many small business owners get overwhelmed when it comes time to do taxes. It’s hard to gather a year’s worth of data and keep up with the demands of running a business. Don’t wait until you have to file an extension for your tax return. Let Clarity Finances help you throughout the year and make tax time a breeze. If you find yourself in need of financing whether it is to expand, make a large purchase or just have to get through a cash flow crunch—you have to have accurate financial information. Whether your printed statements from your QuickBooks file go directly to a lender or to a CPA first, clean QuickBooks data will save you time and money. It might even be what gets you the loan. Before I started working with Julie of Clarity Finances, I was struggling with entering data in QuickBooks the correct way. It was causing me anxiety that I wasn’t keeping up with my books for my business. Julie trained me on how to enter the type of transactions I need to enter into QuickBooks. She also told me tips and tricks to make my QuickBooks experience easier. Then she checked everything I did and cleaned up my mistakes. Julie clearly explained how to create invoices, receive payments and record deposits and where to enter credit card fees for PayPal and Intuit Payment Network. She helped me know where to classify expenses for business. Since Julie started working with me I have found that I have peace of mind that the financials of my business are in order and I can present them to my accountant with no worries. And I have seen that I have more time to work on client work and therefore increase my revenue. Before I started working with Julie of Clarity Finances, I was struggling with proper data entry and communication of financials with accountant. It was causing me lost time trying to correct data entry issues and fees incurred from the bank. Julie completed how to work seamlessly with QB, myself and my accountant Julie clearly explained how to work with QB as a business owner. Since Julie started working with me I have found that my finances are in order monthly and end of the year communications with CPA are more clearly clarified. 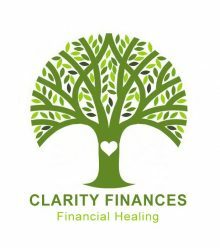 I feel comfortable knowing Clarity Finance is helping my business grow. Leaving me more time to work on other important facets of small business ownership.